Long Term Recovery Groups (LTRGs) may use other language to describe themselves i.e. “recovery coalition,” “unmet needs committee” or “community roundtable” but the focus is always similar: providing coordinated service to enable everyone in the community to recover. LTRGs are often formed from and/or by the local Voluntary or Community Organizations Active in Disasters (VOAD/COAD) if one is active in the area. Similarly, local emergency management recovery staff or Federal Emergency Management Agency (FEMA)’s staff acting as Volunteer Agency Liaisons (VALs) may help pull together the first few meetings. The structure of an LTRG will vary depending upon impact of disasters, size of community, number of VOADs in the community, pre-existing strengths of community organizations, etc. ; ideally, staff should be hired to run an LTRG or there here should be an organization dedicated to providing backbone support to help call meetings, form agendas, take minutes and enable communications. A fiscal sponsor is also needed to support fund development activities; this could be a community agency or a philanthropic partner. Most LTRGs create by-laws to govern the work and sub-committees to carry out the activities of the LTRG in coordination with existing agencies. In Monroe County, Florida, a LTRG was formed to support recovery in the Florida Keys after Hurricane Irma. The sub-committees of that LTRG include: Crisis Counseling/Spiritual Care, Community Assessment/Unmet Needs Committee, Disaster Case Management Committee, Finance Committee, Donations Management, Volunteer Coordination/Management, Construction Coordination Committee, Government Coordination Committee and Communications/Public Relations Committee. Full details about the committee, minutes and bylaws are available here. Each LTRG also needs to decide on its priorities as it is unlikely there will be sufficient funds to assist everyone who needs support. Many LTRGs focus on providing coordinated case management services to the most vulnerable populations affected by a disaster. Most LTRGs focus at a very local level — in most places a community or region, although in a large city LTRGs may be further broken down by area. After Hurricane Irma there were 20 LTRGs operating in Florida. There is no right or wrong way to structure and run an LTRG. Rather than a one-size-fits-all approach, LTRGs should be adapted to meet the needs of their community to provide the most effective use of existing resources and supports. FEMA VALs are able to provide start-up, technical assistance and support to local LTRGs as they are getting off the ground. This support is invaluable to reduce the time spent creating processes and structures since VALs are able to share promising practices from other communities and past disasters. They can also help explain the FEMA process and other services that may be available to support survivors. Become a fiscal agent. Each LTRG needs an organization to serve as its fiscal agent. This can be done by any 501c3 and the role is often fulfilled by the local United Way. Other philanthropic organizations and community foundations, in particular, can provide this service – particularly with no or low fees – to help their region recover. Support administrative and operating costs. Like VOADs, the staffing of an LTRG is usually done by an existing staff member at a support organization. This then becomes an add-on to their post-disaster work. By providing ongoing, administrative and operational support, a funder can help increase the efficiency and effectiveness of a group. Participate in an LTRG. Instead of simply giving funds, consider joining an LTRG to get a better understanding of the disaster playing field, including the unmet needs of the most vulnerable populations in your community. Recognize the implications of “long-term.” Disaster funding is often given in the immediate relief and response phase. However, long-term recovery groups are frequently active for years after a disaster and need ongoing funding throughout that time. Provide multi-year funding. Allow LTRGs to focus on the clients rather than fund development by providing multi-year general operating support. The CDP Hurricane Harvey Recovery Fund provided a $250,000 grant in April 2018 to the Coastal Bend Disaster Recovery Group (CBDRG). CBDRG is composed of government, faith-based and nonprofit organizations working together to support disaster recovery in the six counties in the Coastal Bend area. 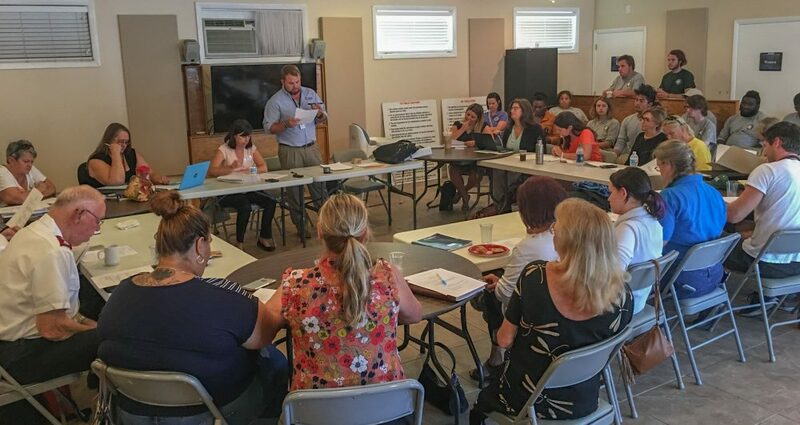 The grant is supporting work with case managers to identify an estimated 8,000 households and refer them to community resources for further assistance; purchasing materials for and coordinating the repair or rebuild of more than 100 homes; and starting an initiative to address additional unmet needs in the area. In 2013, the Robin Hood Foundation provided a $2.2 million grant to the Ocean County Long Term Recovery Group to seed unmet needs fund for Ocean County, New Jersey following Hurricane Sandy, where more than 6,000 households sustained losses between $5,000 and $17,000 and where 8,000 households experienced losses in excess of $17,000. The fund provides mental health support and cash assistance to rebuild and replace household possessions.